If you love vegan food and drinks, then hot maca chocolate is for you. It is a unique and exciting vegan treat that you can pair your favorite vegan snacks to satisfy your cravings. It’s also a great substitute for your coffee; not only will it give you a gentle boost, but it has a wealth of health benefits. Before we get to the hot maca chocolate recipe, though, let’s talk about the health benefits of maca. Incorporating maca into your daily diet can help boost your energy levels and increase endurance and stamina. It is ideal for athletes performing energy-demanding activities. Maca has also been shown to expand and sharpen mental memory and activity, making it an excellent remedy for fatigue. Maca can be helpful in relieving various side effects of menstruation and menopause. It is effective especially in alleviating hot flashes and cramps. Adding maca to your diet can do wonders for the health of your skin. Maca has anti-inflammatory properties effective in fighting acne or blemishes. Maca can also help reduce the sensitivity of your skin. Maca can provide effective relief for those suffering from mood swings, anxiety, depression, and other pre-menstrual symptoms. Hormone-balancing foods like maca can help regulate mood, sexual function, and emotions and prevent diseases. Maca is rich in vitamins, minerals, amino acids, enzymes, and antioxidants. It contains glucosinates, which are powerful antioxidants usually found on cabbage, broccoli, and other cruciferous vegetables. Knowing the multiple health benefits of maca, now you can enjoy it even more! Here is the recipe for hot maca chocolate. Heat the almond milk and wait to simmer. Blend it with maca and cacao powder for few seconds. Then, pour the mixture into your mug. Sprinkle some cinnamon and cacao on top. Take a sip and enjoy its aroma and flavor. 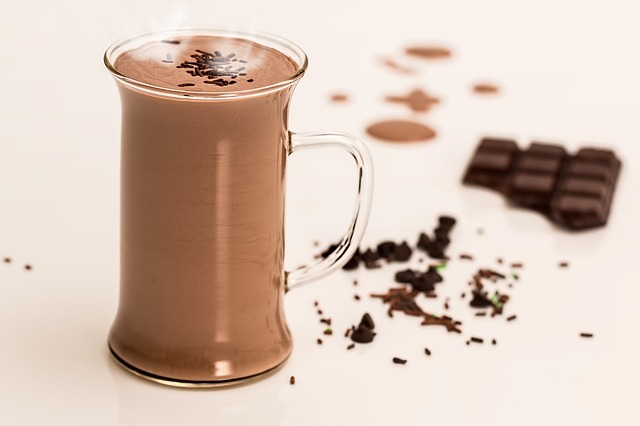 With this simple recipe for hot maca chocolate, you can enjoy a delicious and healthy beverage. Start making maca part of your healthy diet and experience a more satisfying lifestyle. Stay healthy! PS 70%+ dark chocolate is good for you. Not the block but a couple of squares :-).